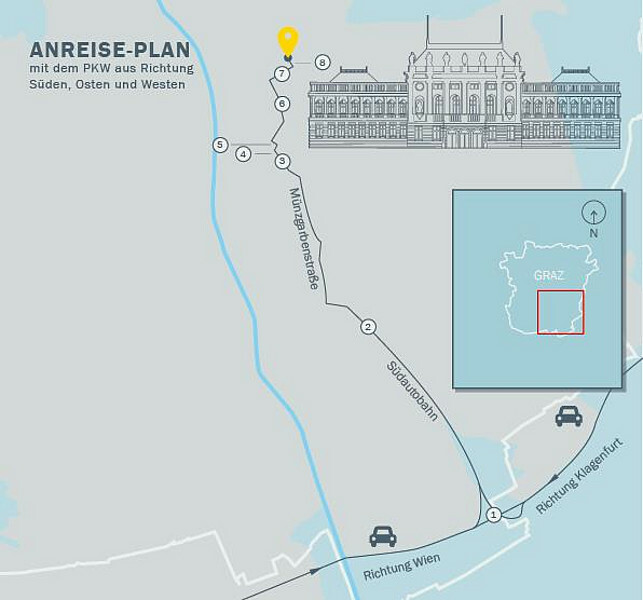 Take the first (1) exit "Graz Nord/Zentrum" and turn left after about 600 m in the direction of Wiener Straße/B67. Soon afterwards, turn right onto Weinzöttelstraße/B67a. Follow this road for 4 km. Bear left onto Parkstraße/B67a and remain in the left-hand lane. Bear left again onto (2) Heinrichstraße/B72. After about 300 m, turn right onto (3) Goethestraße, then turn left onto (4) Harrachgasse and finally right onto Halbärthgasse. 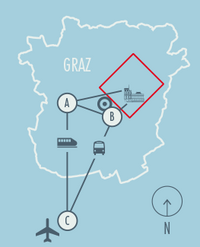 Take the exit in the direction of "Graz-Ost/Zentrum" at (1) the interchange "Graz-Ost". Travelling further on the A2 (Süd Autobahn), this merges with the (2) "Liebenauer Tangente" (Expressway). 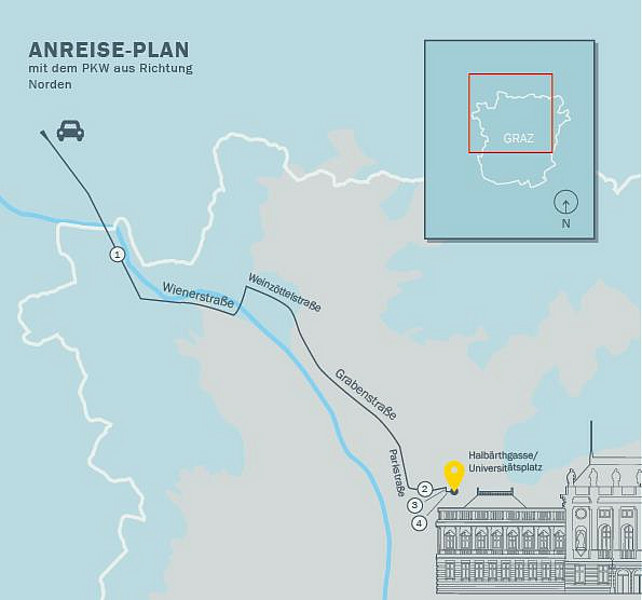 Continue driving in the direction of "Graz Nord/Liebenau" for approximately 850 m. Bear right in the direction of Münzgrabenstraße. Turn right onto Münzgrabenstraße. Follow this road until you reach (3) Dietrichsteinplatz. Turn right onto (4) Schlögelgasse. This bears to the left and turns into (5) Luthergasse. 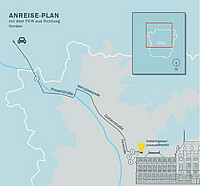 After about 100 m, turn right onto (6) Glacisstraße. Follow this road for about 1 km. Then, turn right onto (7) Zinzendorfgasse. 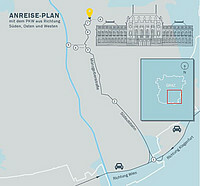 At (8) Sonnenfelsplatz, turn left onto Halbärthgasse. 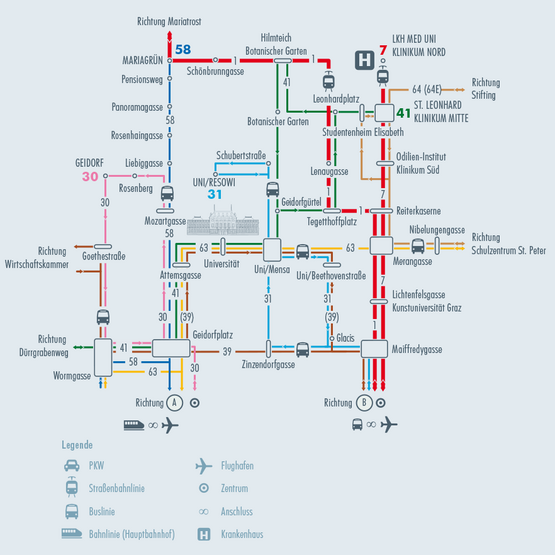 Take Bus 58 toward "Mariatrost"
Take Bus 63 toward "Schulzentrum St. Peter"
Take Bus 31 toward "Uni-ReSoWi"
Take Bus 39 toward "Wirtschaftskammer"
Take Bus 41 toward "St.Leonhard/Klinikum Mitte"
Take Tram 1 toward "Mariatrost"
Take Tram 7 toward "St. Leonhard/Klinikum Mitte"
Take Tram 3 toward "Krenngasse"
You will find a taxi stand out in front of the Graz Airport (outside the Arrivals area). By calling +43 (662) 8161, you can order a taxi in advance. The bus stop (Graz Airport) is located right in front of the main airport terminal. The suburban train station ("S-Bahn" Line 5, which runs from the Graz Airport in Feldkirchen) is located a walking distance of about 5 minutes away from the terminal. For more information, click here.